The input voltage is filtered from transient voltage spikes via the 10 ohm resistor and the 0.1uF capacitor on the input of the 78L08 regulator. The 1 Amp series fuse and Transzorb protect the circuitry from short circuits and over-voltage conditions. The 78L08 voltage regulator provides a constant 8V DC supply to the meter circuitry through the 10-15V input voltage range. The dual op-amp is supplied with 0V and 8V for the power rail inputs. 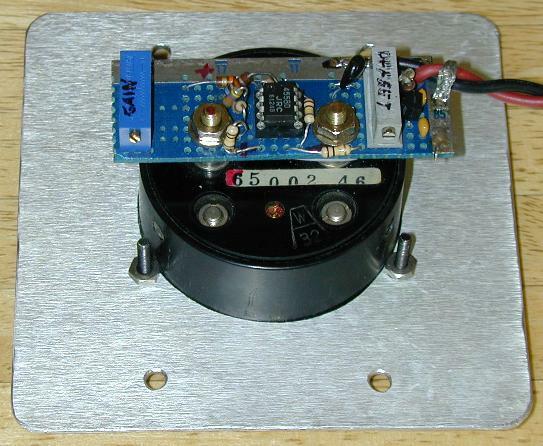 The lower op-amp is set up as a buffer stage to provide a 4V virtual ground reference voltage. The virtual ground is used as a current sink for the meter, and as a reference point for the other op-amp. A 78L08 regulator may be a difficult part to find, a good replacement would be an LM317L adjustable regulator circuit set to 8V. Other dual op-amps should work well in this circuit, the 1458 is a good substitution, an ultra-low power dual op-amp can be used if power drain is a consideration. The upper op-amp is configured as a voltage summing circuit with adjustable gain. Gain is controlled by the 100K feedback resistor. The gain control adjusts the meter sensitivity across a voltage range. 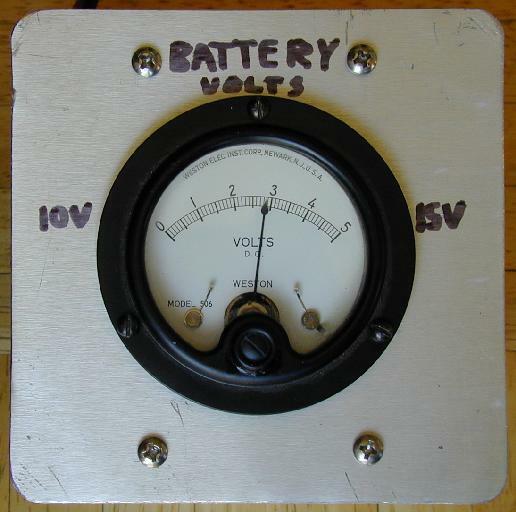 The measured voltage comes into the upper op-amp's + input via a 100K/47K voltage divider. The offset control creates a second + input voltage that is summed with the measured voltage through the 68K resistor. Adjustment of this control moves the meter position up and down, it is used to set the meter movement at 0 when the minimum measured voltage (10V) is applied to the circuit. The meter shown has a sensitive 50uA full scale reading, more common 1ma meters can be used by reducing the value of the 47K meter series resistor to 2.5K. An approximately 1"x3" piece of perforated circuit board material was drilled with two holes so that the board could be mounted on the two terminals of the analog meter. The parts were assembled on the perforated board and connected together with point-to-point wiring. Teflon insulation was used over bare wires to make the cross-board connections. The two battery leads were twisted together, then secured to the edge of the circuit board with a loop of wire to prevent movement. The meter was mounted on a 4"x4" metal plate that was cut and drilled to fit onto a standard electrical switch box. The box should be deep enough that the meter and accompanying circuit board do not touch the back of the box.